Yeah, that’s a pretty good deal for the small cities. 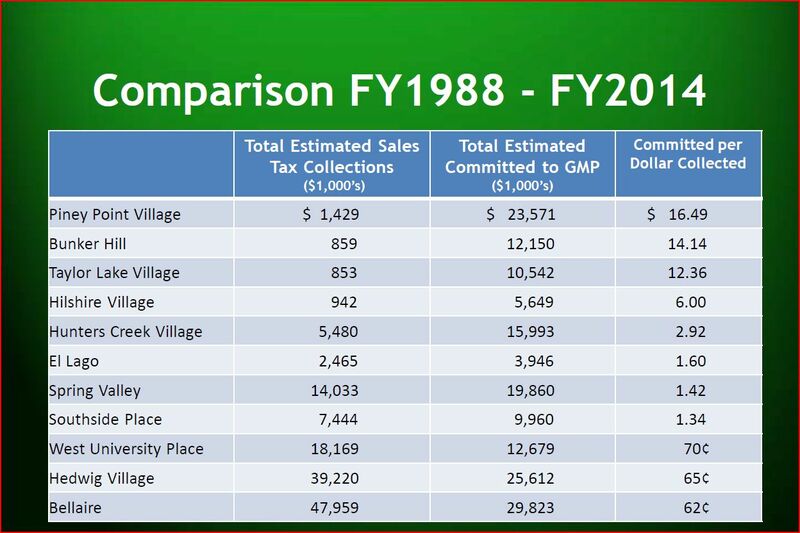 In fairness to Missouri City Mayor Allen Owen, the chair of the small cities coalition, his own town gets a mere fifty-four cents on the dollar back from the GMP. I’m pretty sure Houston would take that deal. All these cities also get things like park and ride lots, MetroLift, and the benefit of the HOV lanes. Metro has spent a ton of money on the park and ride/HOV network. I suspect the motivation of the small cities is in part a belief that changing the formula means more will be spent on light rail, which being inside Houston doesn’t benefit them much, though again Missouri City stands to gain from future rail construction. The point is that the money Metro gets goes to a lot more than buses and light rail. I’m really hard pressed to see how altering that equation a little in favor of the latter is unfair to the current participants. As we know, Metro is preparing for a referendum this fall on the status of the general mobility fund, which is one fourth of the sales tax revenue Metro collects and which goes to Metro member cities for road projects. Metro Board Chair Gilbert Garcia has suggested freezing the payments after 2014, with any future revenue increases going back to Metro for transit work. Freezing the payments would give Metro flexibility to invest more money in transit improvements, Garcia said. Some transit supporters say Garcia’s proposal is a step in the right direction but would still consume funds needed to complete the light rail system. The coalition of multi-city mayors, however, wants the payments to continue in full. Dan Barnum, a board member of the Citizens Transportation Coalition, suggested that Metro reduce the mobility payments to 10 percent. Expanding mass transit, he said, is essential if Houston is to remain competitive. I am more sympathetic to Barnum’s position than I am to Owen’s, but I can live with Garcia’s compromise. If we’re going to have a public debate about the need for Metro to continue making these payments to the general mobility fund, we ought to have as much information as possible about the money involved. Owen claims that the small cities are subsidizing Metro. 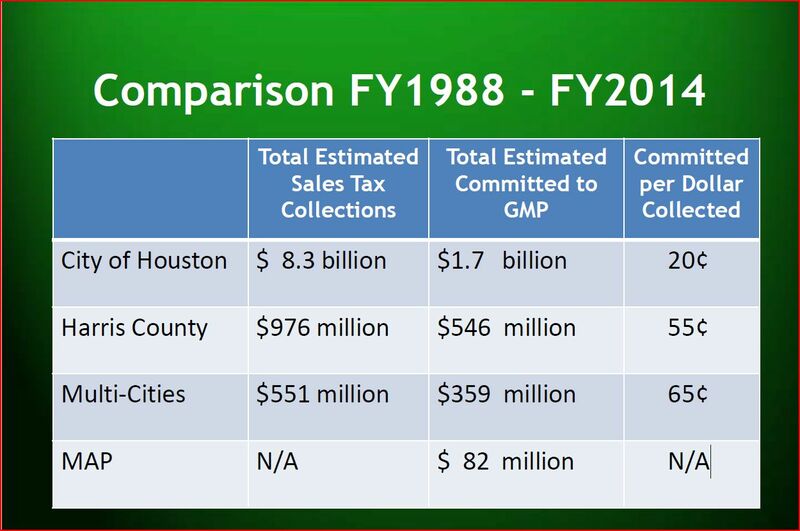 I presume by that he means that the 14 smaller cities contribute a larger share of sales tax revenue than they get back in general mobility funds. That’s an objective claim that ought to be easy enough to verify, and I call on Metro to provide those figures. Similarly, we should know what exactly the smaller cities are using their share of the mobility funds for. I have heard claims over the years that some of these cities get more mobility funds than they have road-related need for, and as such they are used as general revenue for them. I call on the 14 small cities to provide some accounting for how they use these funds. Let’s get all the cards on the table and come to an informed decision about the best and fairest way forward for everyone.